You've got to love American democracy. Here we have the right to religion, open protest, carry firearms, and gorge ourselves to death. 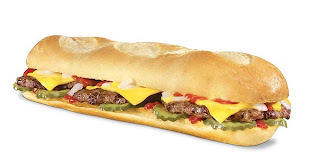 Witness Carl's Jr.'s latest concoction, the Footlong Cheeseburger. Made of three burger patties stuffed between a twelve inch roll, this baby packs 850 calories, 45 grams of fat, and 2490 mg of sodium. Despite all the nagging from the government, doctors, and scientists to eat less, these restaurants know what their customers want, and that is to get as much food as possible for the least amount of money. And the customer is always right even if he is killing himself in the process. Who wouldn't want to buy this monstrosity at only $4 a pop? It's cheap, filling, and satisfying. And if you can't finish it you can always share it with a friend or three or save it for another meal later in the day. In America we are allowed to abuse ourselves any way we want. Just don't foist your hospital bills on me later when you're getting treated for your diabetes and coronary artery disease.